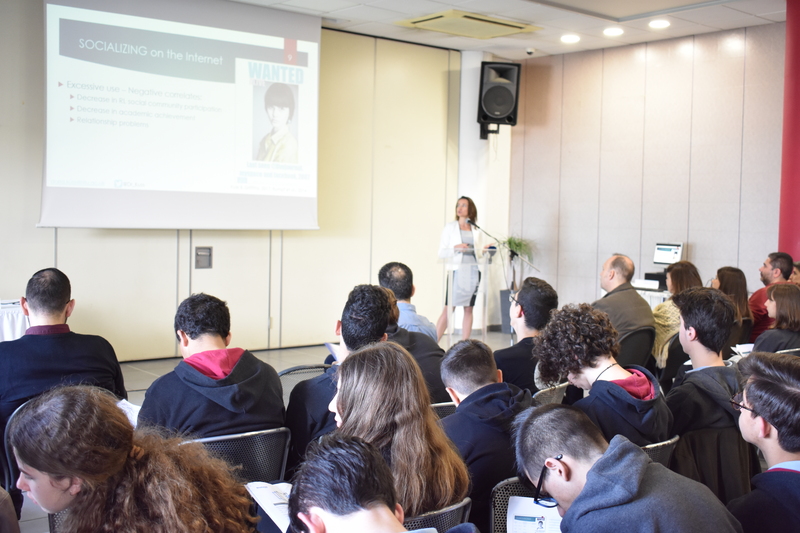 The EU Conference of the Erasmus+ KA2 Youth project “inScreenMode” – MODEration strategies of SCREEN abuse of Generation Y(outh) was organized by Emphasys Centre on the 5th of April 2019 at the G C School of Careers, in Nicosia, Cyprus. The conference was highly successful and managed to attract the attention of many teachers and students. During the conference, Dr Daria J. Kuss, Senior Lecturer- Chartered Psychologist at the Nottingham Trent University gave a speech on ‘Internet and Gaming Addiction’, whereas Ms Katerina Giannakaki presented the inScreenMode Project which aims to empower young people (16-25 years old) to deal effectively with situations concerning excessive preoccupation with Internet, equipping them with the skills and the methodological and technological tools to modify computer behavior for healthy computer use. As part of the conference, the online GENIE tool was presented to the students to explain how online behaviour and Internet use could be measured. At the end of the conference, all participants were invited to test the Genie and were provided with more information regarding the project. The GENIE platform can be found: https://genie.inscreenmode.eu/ and all information are free and user-friendly to use. Next PostFinal Meeting for the In Screen Mode Project!